I love webcomics and indie rock. When I discovered The Chairs' Hiatus by Matthew Bogart, I was very pleased to see something that combined my two loves. It was like the moment when the universe came together at the right moment and put the peanut butter and chocolate together. The Chairs' Hiatus follows a young lady named Mary Sozer who was one-half of a successful indie rock duo. Instead of living the successful indie rocker hipster lifestyle in Brooklyn, Mary is making a living selling t-shirts out of her apartment and slowly coming to terms with her status as a "has been". Her life changes when her former band mate, Nel, shows up with their 'Pete Best' original drummer, Jen, for a reunion of sorts. The reader soon discovers what drove The Chairs apart and how a reunion between Mary and Nel is very complicated. 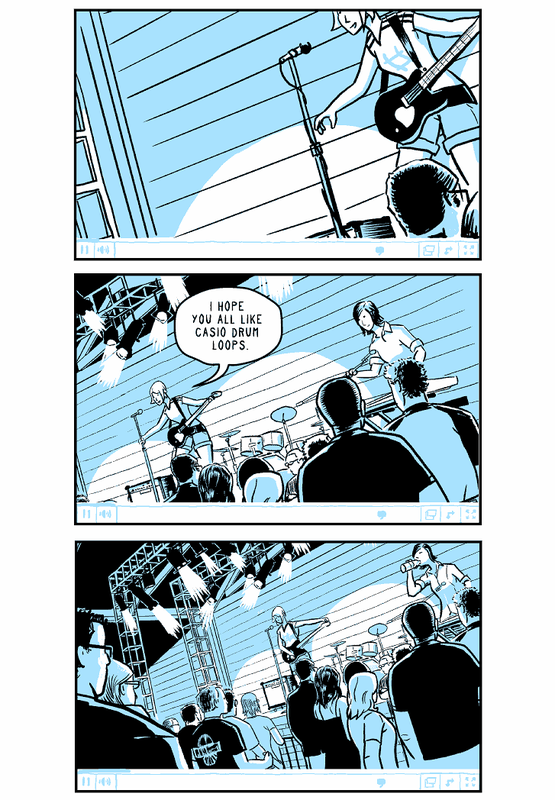 The Chairs' Hiatus by Matthew Bogart is a great webcomic for fans looking for a "slice of life" story with a little bit of rock and roll added to the mix. 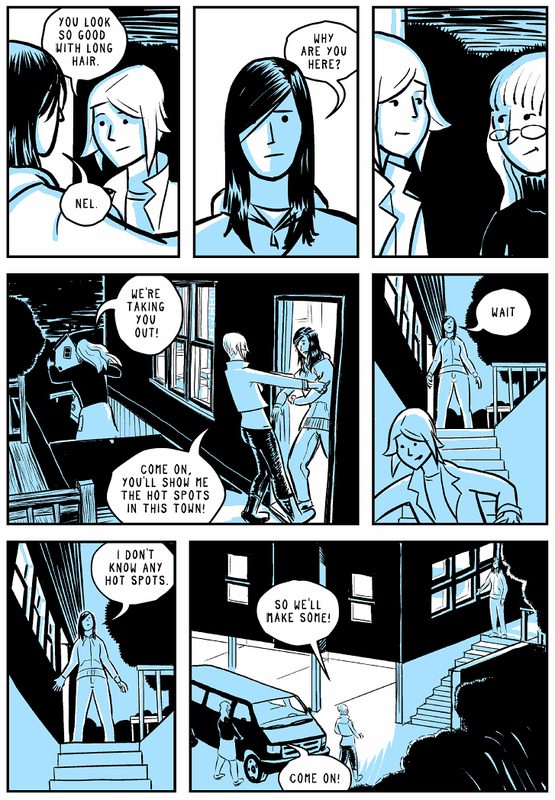 You do not have to be an indie rocker to appreciate this webcomic because it is a story about friendship and forgiveness. Mary and Nel were close at one time and events related to their band drove them apart. Bogart does a really good job of creating an interesting and engaging story. Mary is a very likeable character and we see glimpses into her past as a struggling musician and as an established indie rocker. Nel is also likeable but the reader gets the impression that she is a very complicated person who has had her problems as well, but shares her feelings with a select few. Mary and Nel not only struggle with their friendship but they struggle with relationships outside the band. They both carry the scars and are trying to complete the healing process. Bogart's artwork is excellent with the panels beautifully done in white, black, and light blue. I really like his style of artwork as it has an alternative look that's perfect for this rock and roll tale. Great stuff. You can read The Chairs' Hiatus at Matthew Bogart's website. Click here to read.